Sgt. Maj. Saksit Nakarin was injured when he rammed his car into the back of an employee shuttle van in Sattahip. A solider was injured when he rammed his car into the back of an employee shuttle van in Sattahip. Sgt. Maj. Saksit Nakarin, 34, sustained a chest contusion and cut leg in the March 31 crash on Sukhumvit Road. He was treated at Queen Sirikit National Convention Center. 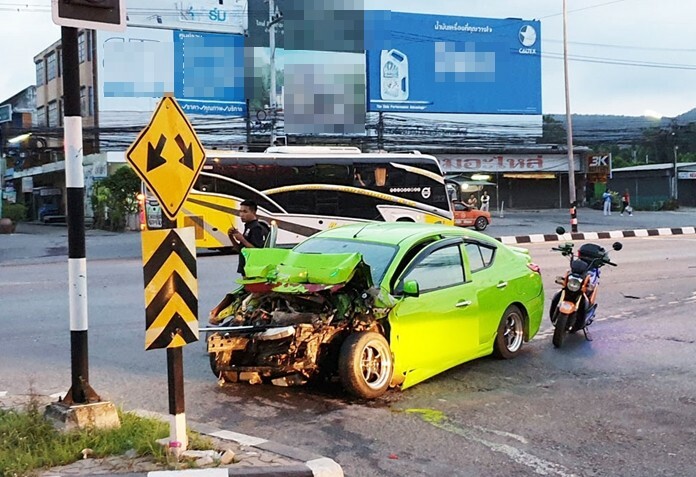 Van driver Siriwit Srithong, 30, said he was stopped at a red light when Saksit slammed his Nissan Almera into the back of the van at high speed. Police suspect Sakskit fell asleep at the wheel. He was charged with reckless driving.